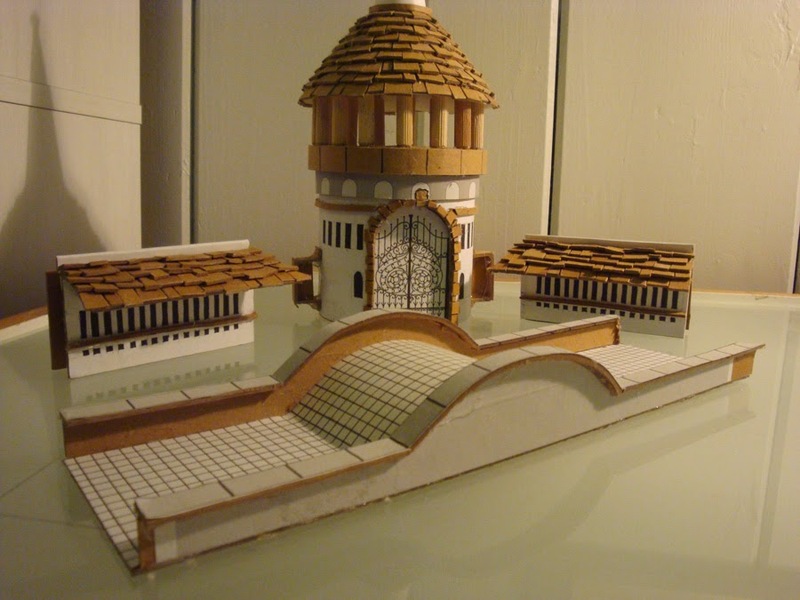 Last week I mentioned the model of the Seyan gatehouse I built for the story "Serive to Seyan" which appears in Baldwin the Brave and Other Tales. Most of the story takes place outside of the mythical mouse champion afterlife of Seyan...specifically at the gatehouse. 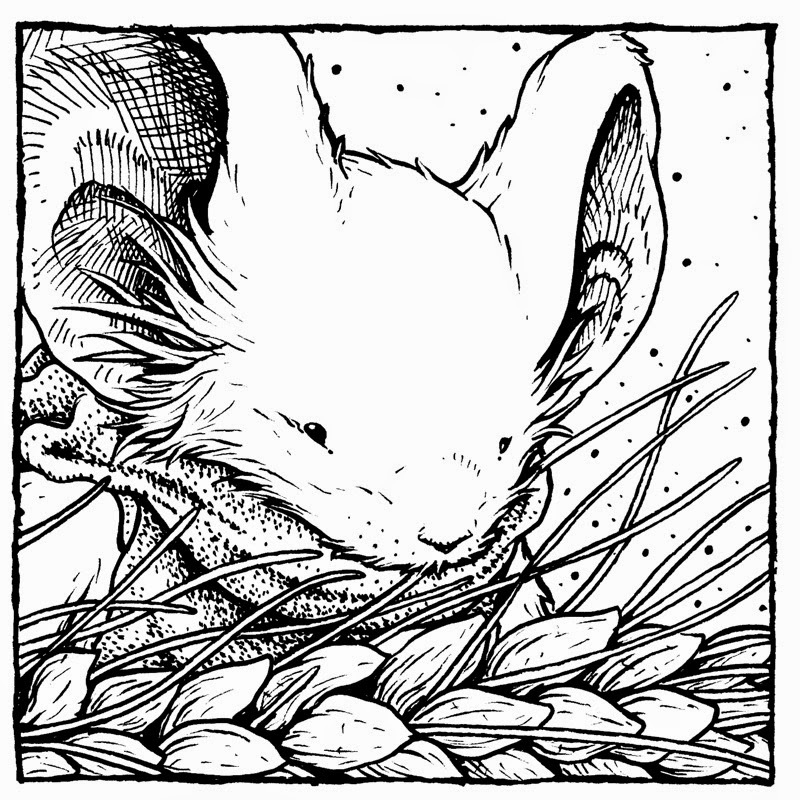 Seyan needed a royalty and majesty unlike what I'd shown of mouse architecture before in the pages of Mouse Guard. 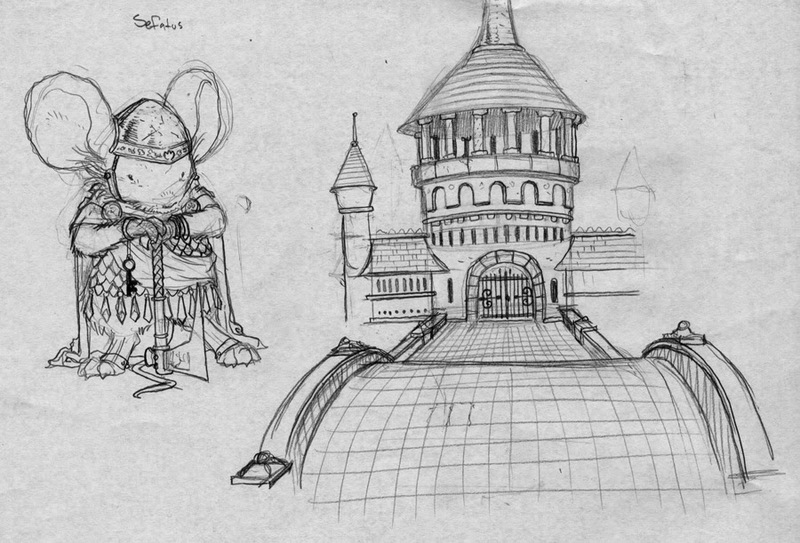 And while the gatehouse isn't going to be as grand as Seyan itself, it needed to look like it fit and belonged. In today's post I'll go through the pre-design of the model and then the model itself. Using the motifs I'd played with variations of all over the larger drawing of Seyan, I did a drawing of a tower perched over a bridge, its gates the only way across the bridge. Walls (which surely encase all of Seyan) also flank the tower (and seem to suggest an internal walkway of some sort). From the start I wanted there to be an arch in the bridge just before the gate. I drew all of this into my sketch and then started creating the model. I built the model over the course of an evening. The main body of the tower is a large packing tube. The shingles and bridge are chip board..the stuff that backs a pad of bristol. I save all of mine when I go through a pack and set it to the side for projects like these. 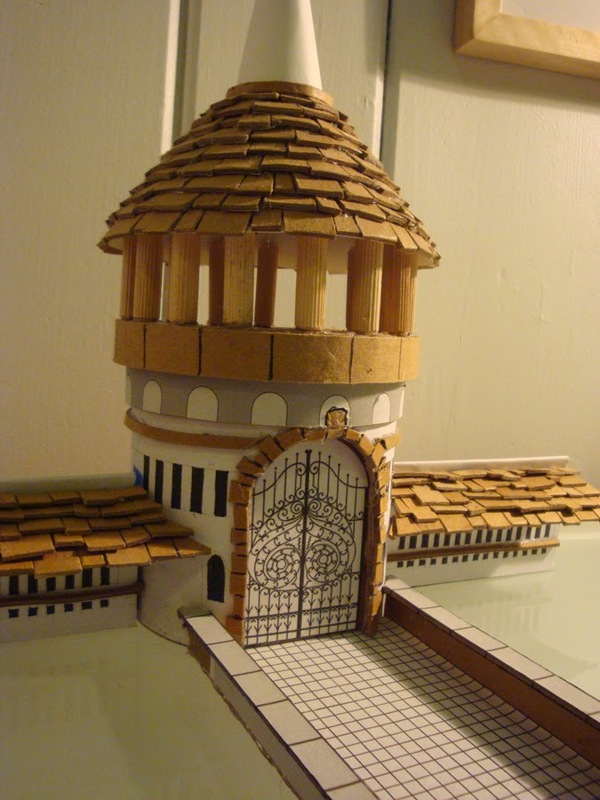 The arches, tiles, and gate details were printed and then glued on with rubber cement. Mostly the piece is glued together with rubber cement though. Oh and this photo shows the bridge arch the best...I used a CD as a template to trace out the sides of the bridge as well as the support under the paper tile floor. I 'skinned' the model with paper that I could draw out the slit windows on to. The arch supports under the gallery rim were achieved by glueing a paper printout to a built up rim made of more mailing tube with the back cut so its inner diameter could wrap around the outer diameter of the tower tube. I repeated this process several times for the lip the columns sit on. I cut in a section for the gate, so the gate didn't curve like the tower, but lay flat recessed inside the tower. On the side you can see a little nub sticking off. 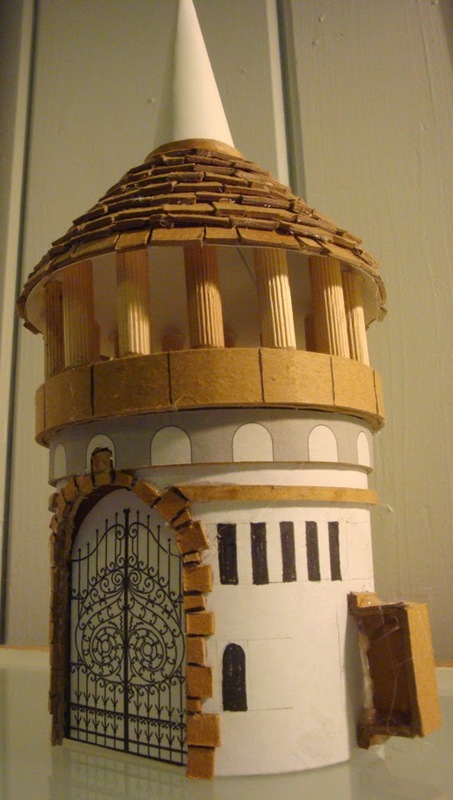 I added the details of the chipboard archway stones as a way to give this model a bit more of three dimensionality, but also as a color variance to help me see areas of the model better. That piece is what keys in the wall piece to keep it in correct alignment when the model is assembled. For the roof I first made a cone out of bristol board and glued it to the dowel columns. After cutting lots and lots and lots of chipboard scraps of slightly varying sized rectangles, I started gluing them on like shingles with the lowest row being glued first and each row going up slightly overlapping the prior row. 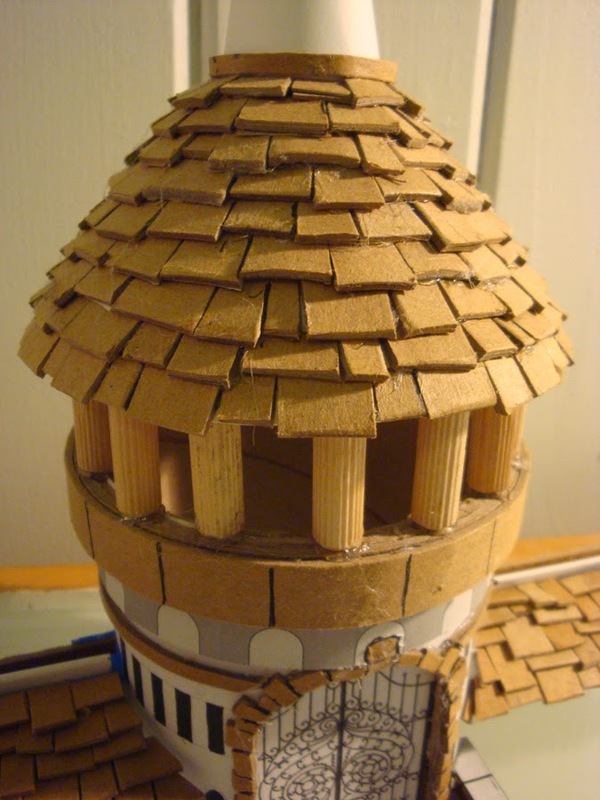 The very top edge is a straight piece of chipboard I curled and wrapped around where the shingles meet the spire. 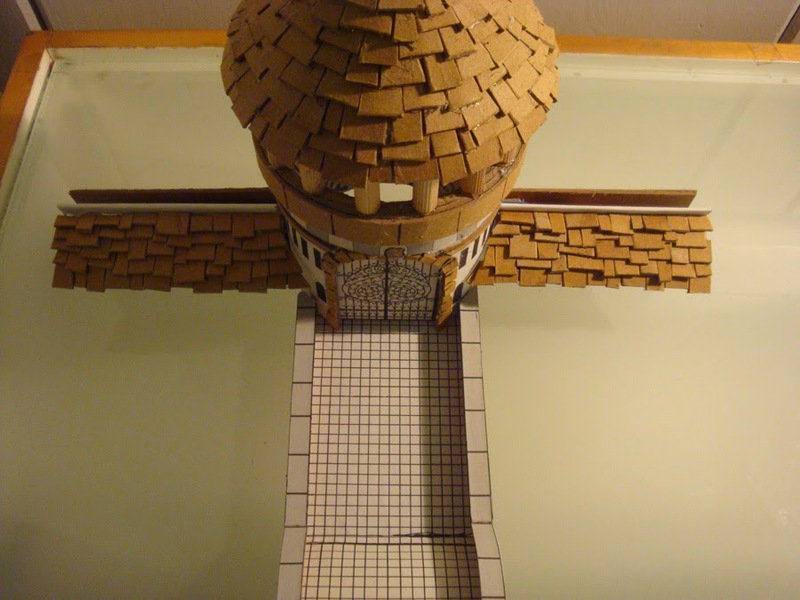 I used the same shingle technique to top the roofs of the walls that abut the sides of the gatehouse tower. Models like this come in handy. They helped me figure out the finer detail designs and placements of the tower in 3d. In my rough sketch, I didn't have those details locked down, and even if I did go to the effort of doing a really tight architectural drawing, I'd only have the place from one point of view and rotation. Building a model is a great way to figure out how different shapes connect in 3 dimensions, how proportions and scale really look (especially when rotated) and so that when, if a story comes along later, you can revisit this location at any angle and not have to rely on remembering what you were thinking or rely on drawings that may not have all the details from every angle. 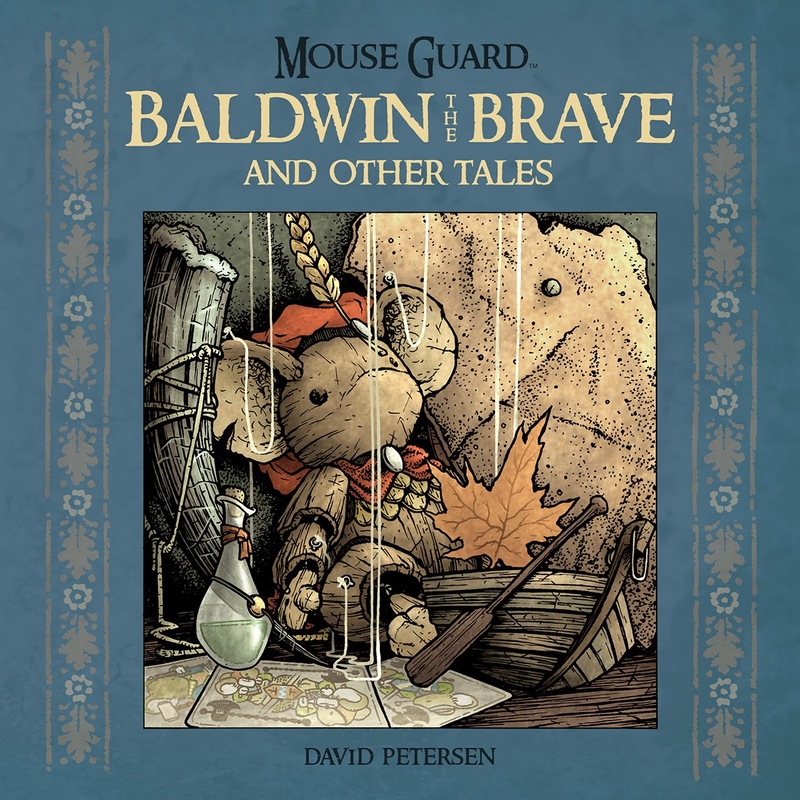 Tomorrow sees the release of the Short story collection Baldwin the Brave & Other Tales. 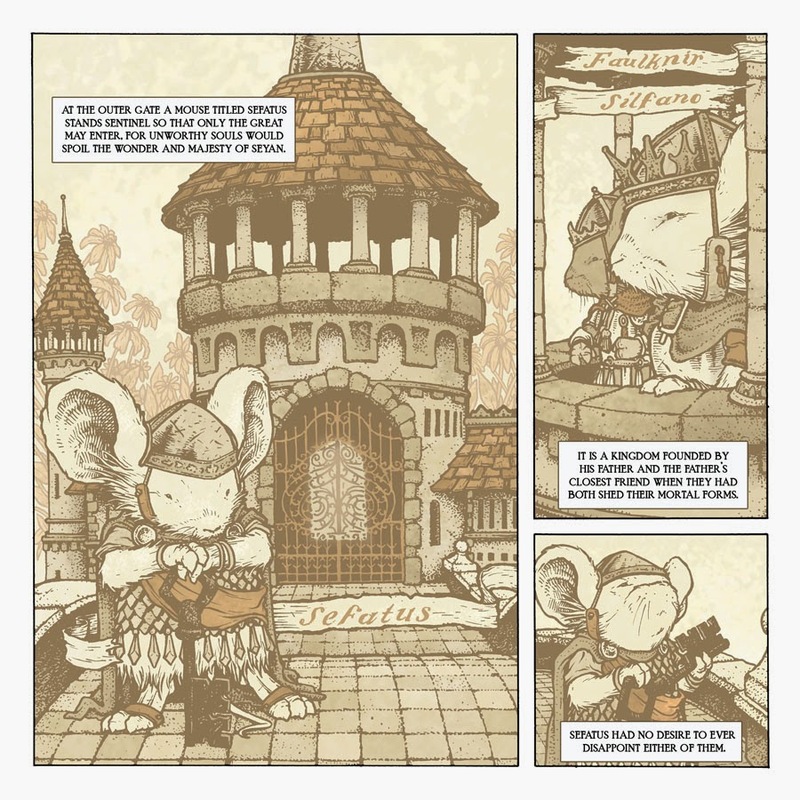 This Mouse Guard book collects my last 4 Free Comic Book Day stories as well as 2 new stories written specifically for the collection. Today I'm going to share a bit about one of those stories: Service to Seyan. 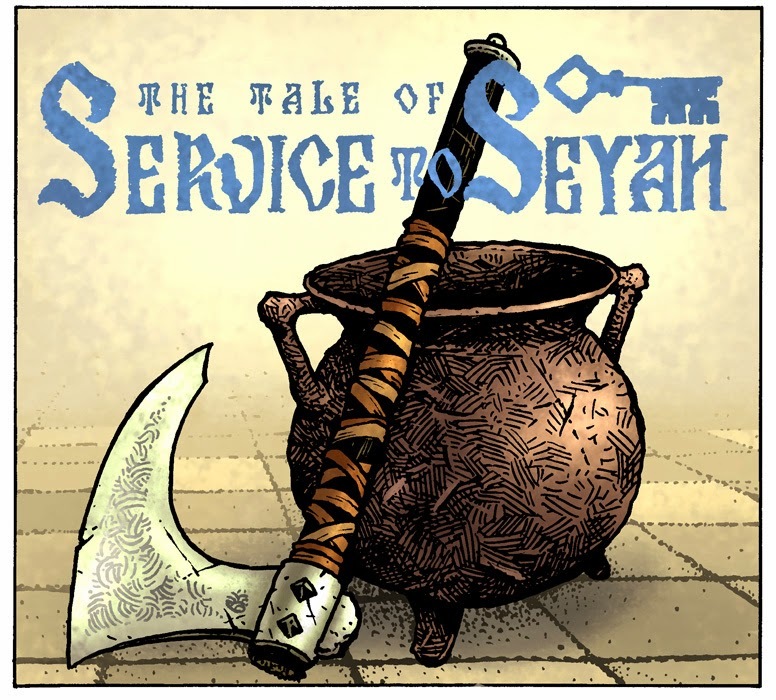 Here is the title card for Service to Seyan...and it doesn't give too much away. 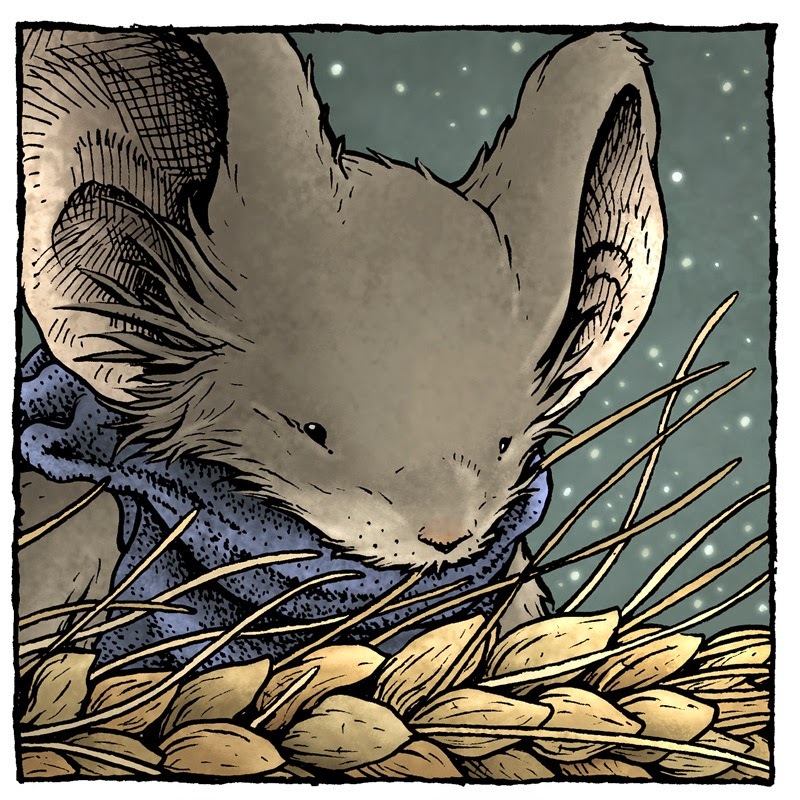 Longtime readers of Mouse Guard probably have some understanding of the word "Seyan" as it's referenced as some sort of afterlife for Guardmice. This story is a cautionary tale about how access to that place is granted. 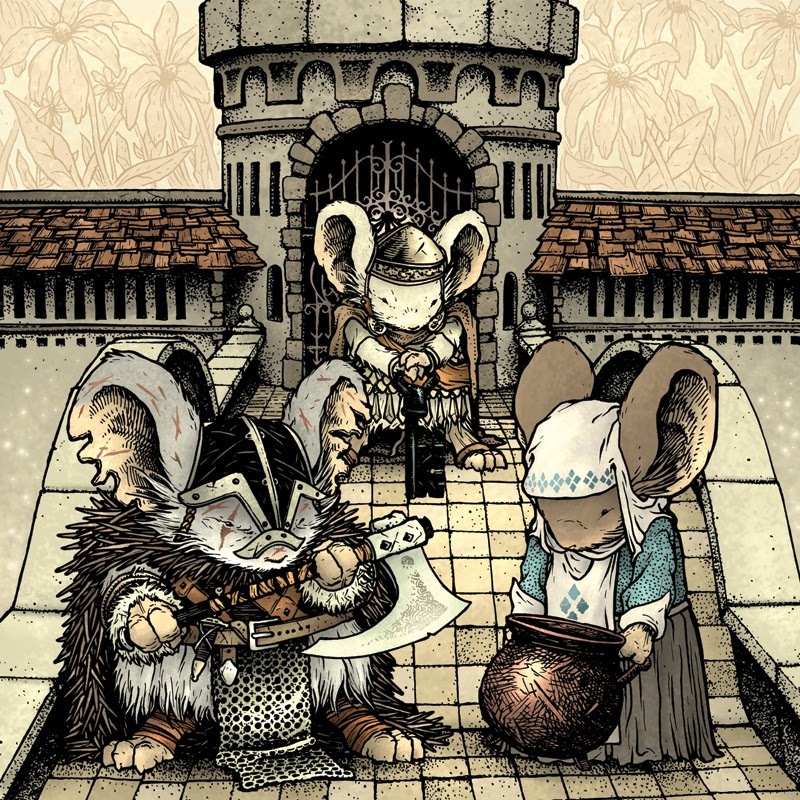 Show in this image, the axe & the cauldron belong to two mice who arrive at the gates of that mythic afterlife and discover what it takes to get in....or at least what it takes according to this tale. 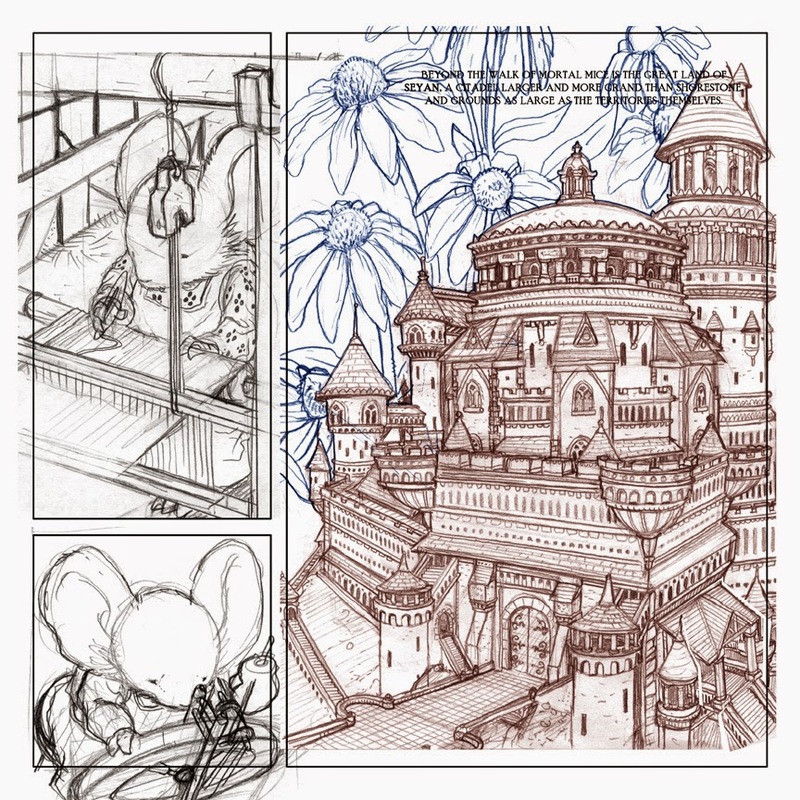 I've designed some locations and buildings in Mouse Guard that I think are pretty grand and designs I'm proud of....but if I was going to visualize an afterlife that is sought after, I needed to up my game and really design the most glorious mouse architecture I could think of. To the left you can see my rough for the page where Seyan as a whole (or mostly) is shown all at once. 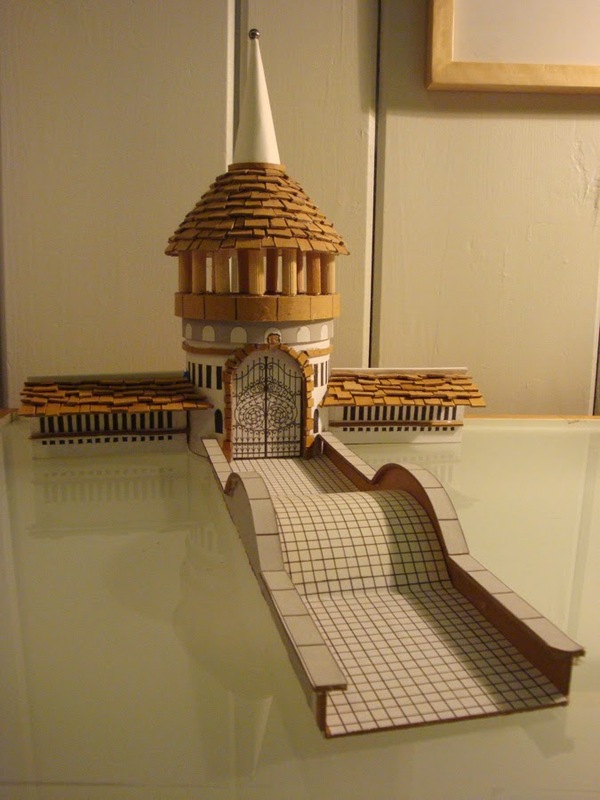 Unlike me, I did this without building a model (and resisting the urge the whole time) I looked at several existing castle and citadel photos and then was heavily inspired by the grandeur Mike Mignola drew into the city of Pandemonium in Hellboy in Hell. However, I was only able to resist building a model for so long. 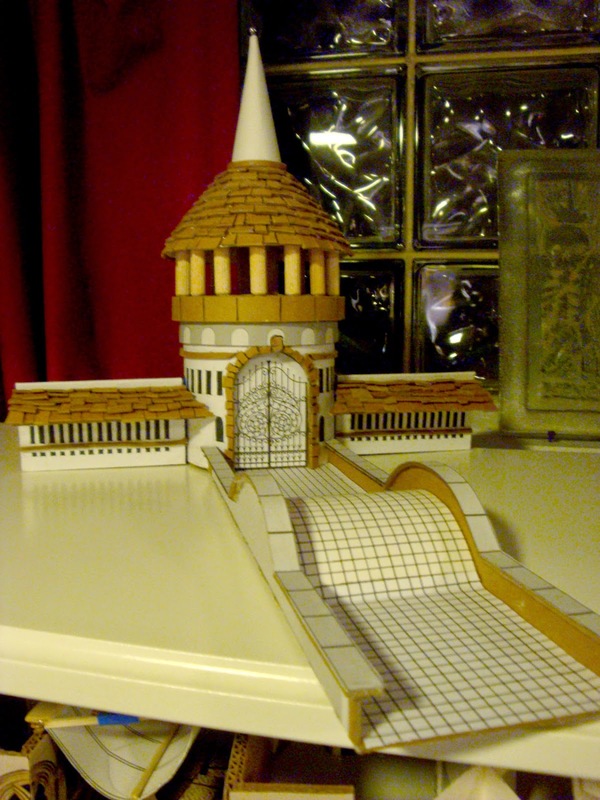 Most of the story takes place at the gates of Seyan rather than inside it, so I built a model of the gatehouse. I did this after drawing the first page where it's shown, so I had to retro-model it to fit what I'd already drawn. I made a few alterations even still and ended up with this piece. It's made of a cardboard mailing tube, printed paper, chipboard, and wooden dowels left over from a piece of IKEA furniture....oh and lots of hot melt glue. 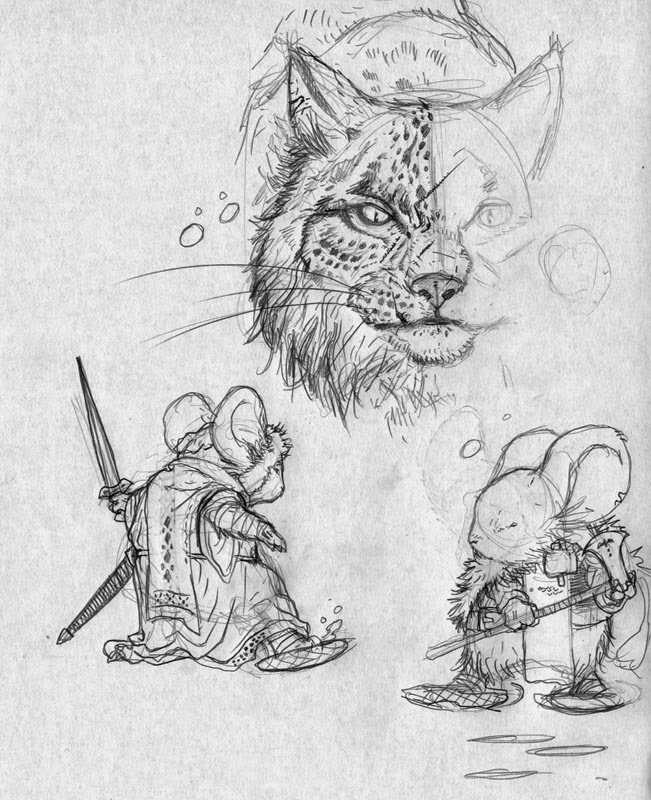 To add some fun call back reference, I made the gatekeeper of Seyan a character from one of my favorite Legends of the Guard stories: The Battle of the Hawk's Mouse & the Fox's Mouse by Jeremy Bastian. 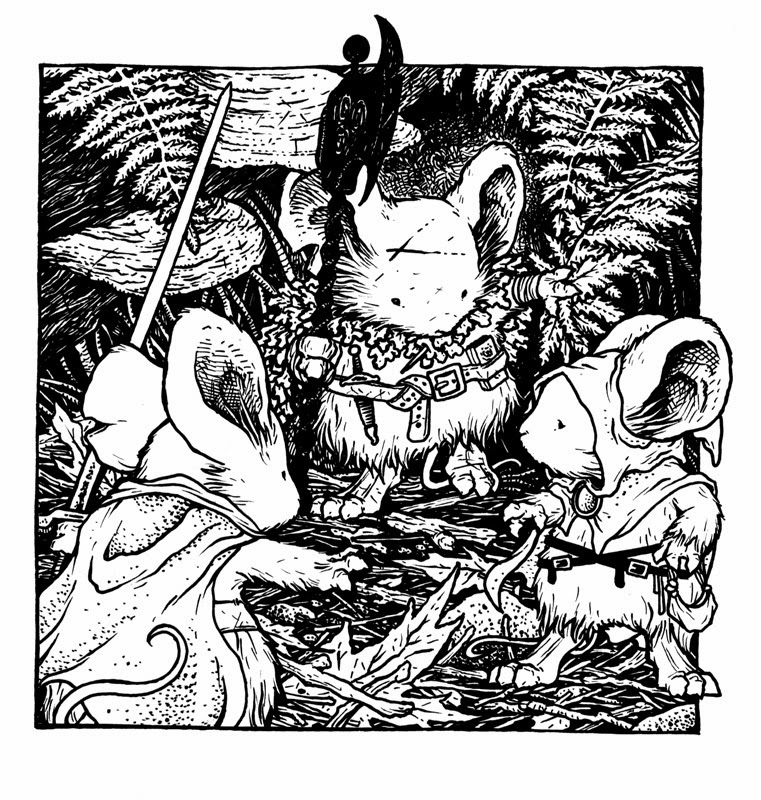 Jeremy's story dealt with a possible backstory of the first two guardmice and the first matriarch. So who better to watch over Seyan than those two mice...and the gate keeper is one of their sons, who is all grown up, but from so long ago that he too has passed on. I'll leave you with one last preview of this story (the "cover"). This week I'm sharing the four commissions I did for the New York Comic Con as well as the rough pencils. 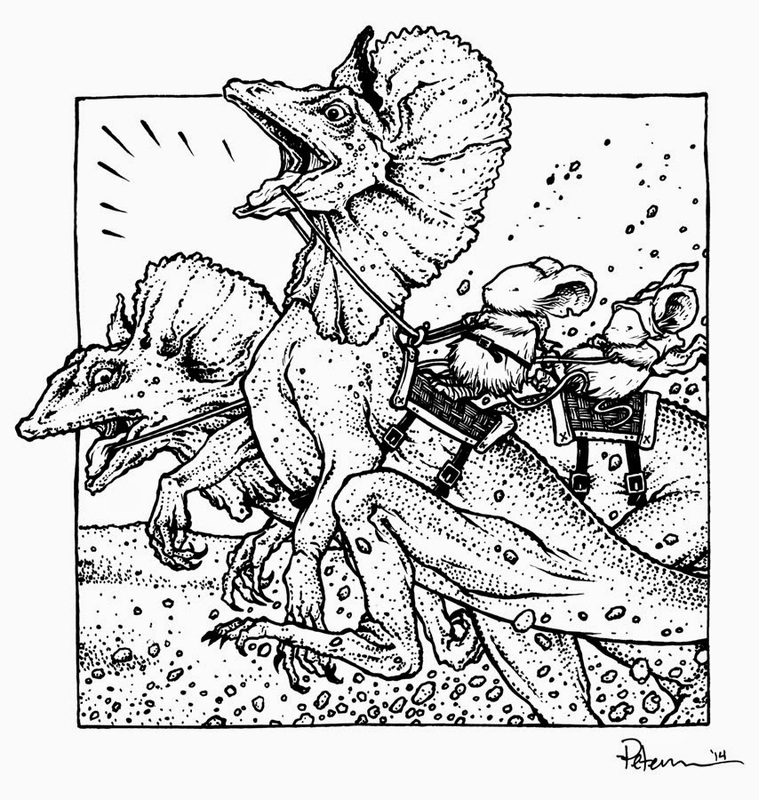 The fan commissioned me to do something like a neck and neck horse race, but with mice riding frilled lizards. The owner of this piece spent some time in Australia, where this species of lizard is found. He also suggested that the mice could have an Aussie look to them if I wanted, but I opted not to do anything too Paul Hogan or Monty Python "Bruce" with them. The pencils were fairly straight forward, I didn't separate out the figures like I normally do so that I can adjust the composition digitally, I just drew it on copy paper as-is and then put it behind my bristol board and used a lightbox to see the pencils as I inked. This request came from a fan in Sweden who was coming to NYC for the comic con. 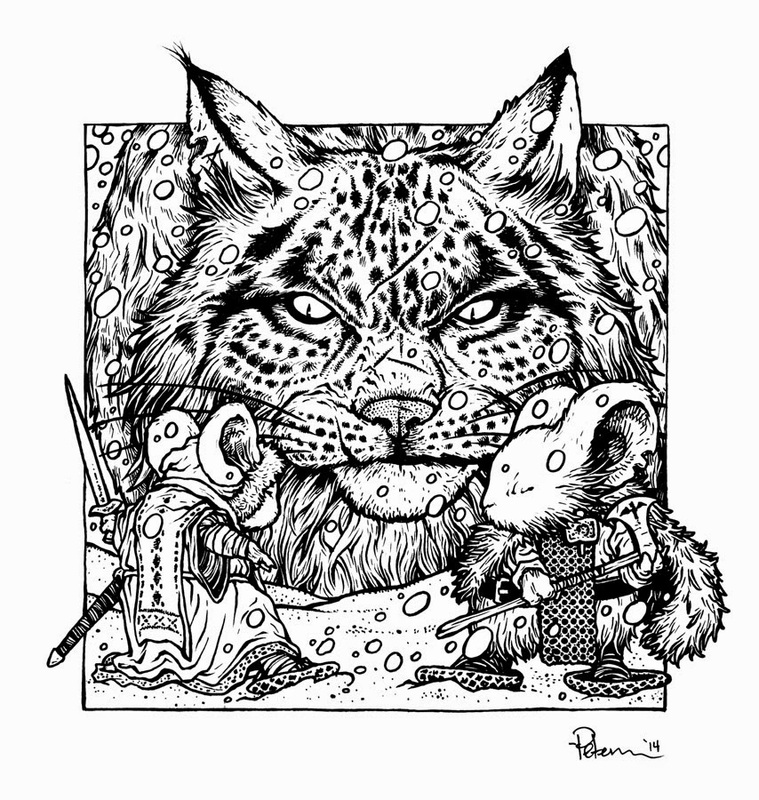 The suggestion being something with snow and a male and female mouse bundled up battling a lynx. The setup was tricky because of the size of the lynx. Anytime someone asks for a vs piece and the other animal is larger than the mice, I have to figure out if they want tiny mice, or a severely cropped predator. I drew only half the lynx so I could mirror the facial spot pattern in Photoshop. A few years ago this commissioner had me do a Fall harvest celebration piece with Saxon, Kenzie, & Lieam. 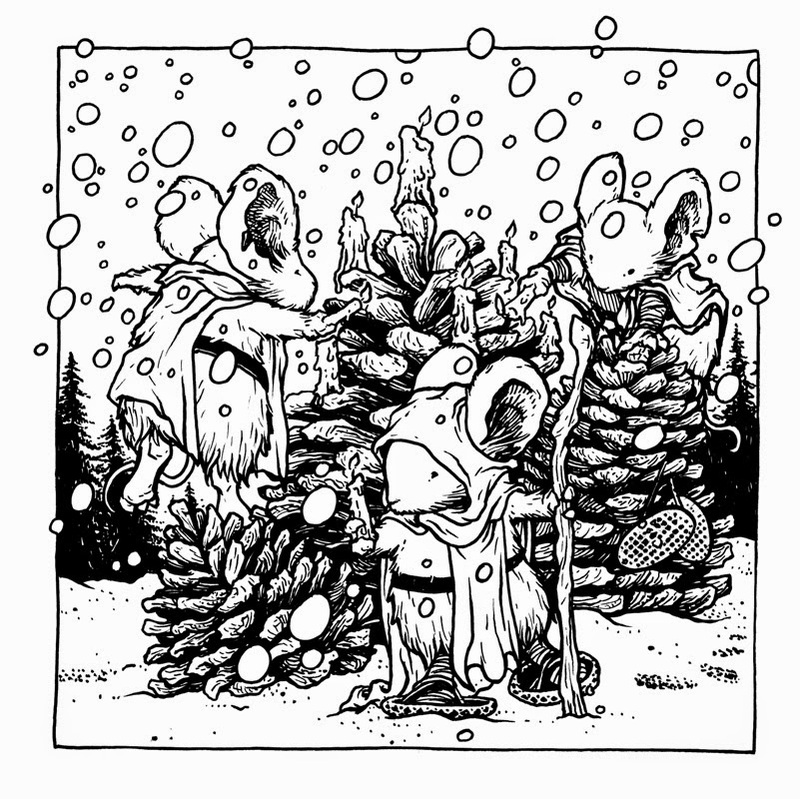 This time he asked for the same crew, but in the snow for the winter solstice and perhaps decorating a tree. I opted for it to be a pinecone for scale. 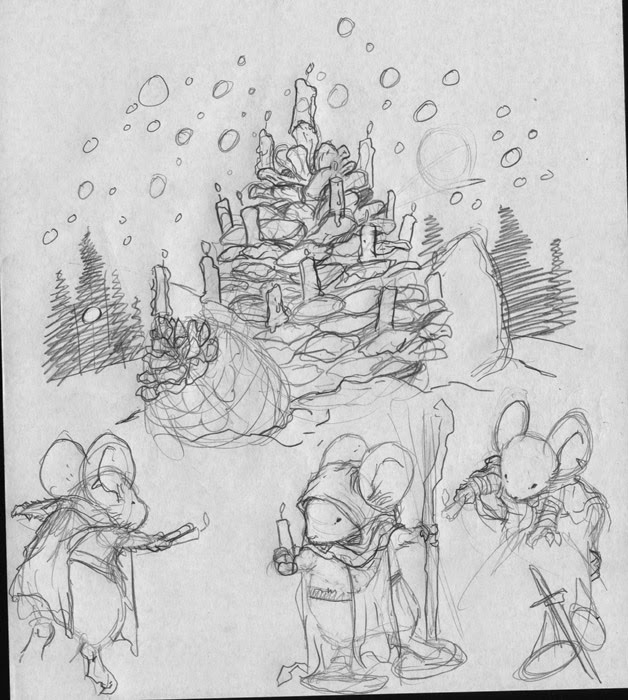 Placing each mouse so their arms would be in the right spot to light a candle and their feet were solid on something, and they weren't blocking the pinecones too much was going to be a trick, so I drew each mouse separately and then assembled the sketches in Photoshop to arrange a final composition. The title pretty much sums up the request. 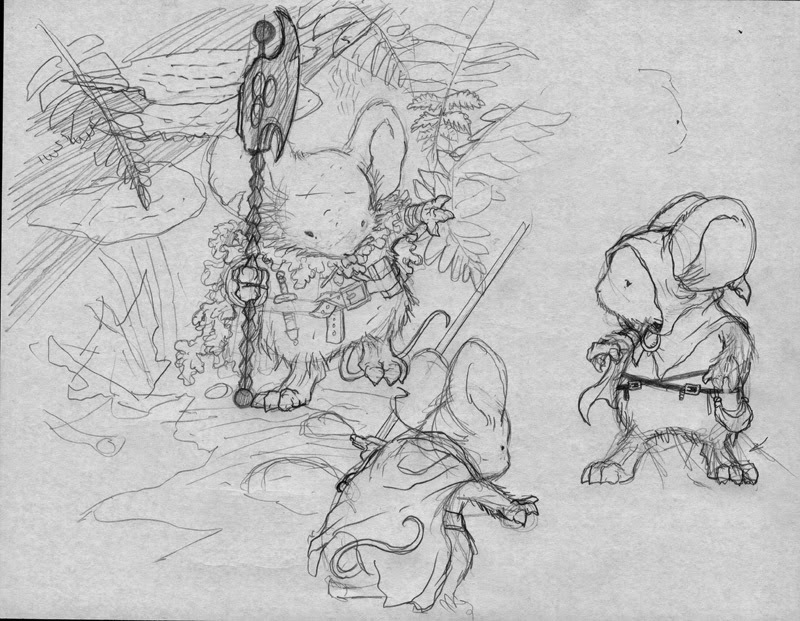 They imagined this scene differently than it will eventually play out in the books (characters, time of year, and location all subject to change), but It's a fun try out for me to think about a moment where Lieam as the Axe is able to reconnect with his former Guardmouse pals. The Sketch was mostly about getting Lieam's reveal pose correct and adding the fall bracken and undergrowth. 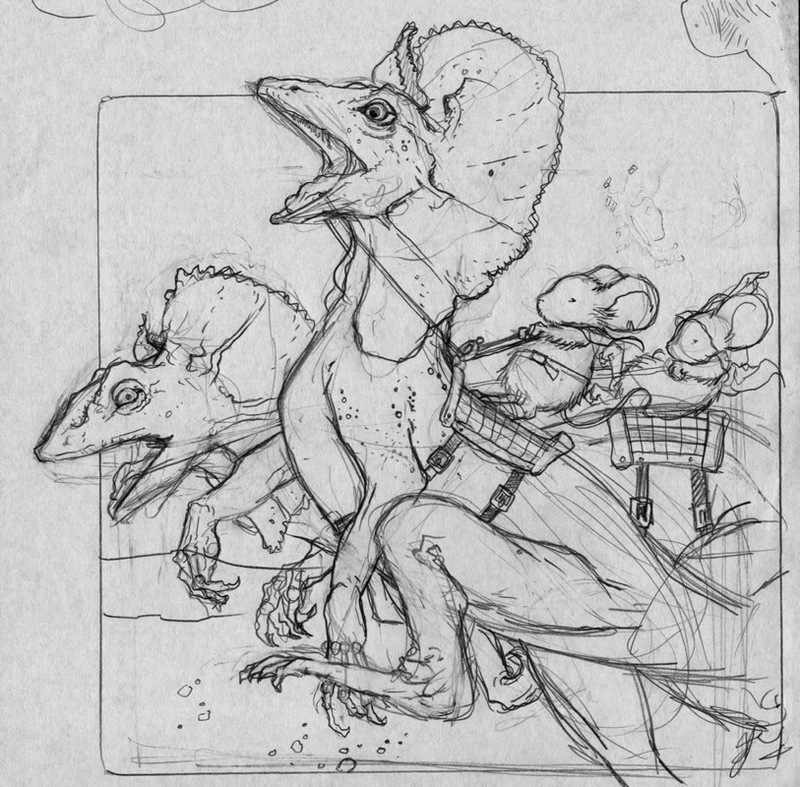 Then I quickly drew a Sadie & Saxon in the lower right so that I could assemble a composition of the three in photoshop before inking the piece.